Jagmaster Owners - Show and explain your mods! Discussion in 'Squier Offset Guitars' started by Botso, Jan 12, 2019. I'm newer here and am in the process of doing my own Jagmaster mod. I have thread going over on the Jagmaster board that will continually be updated! BUT, I want to see all of your mods and creativity right here in this thread. I think it will be a good place for people like me in the future to check out the ideas others had and maybe even be a starting point for their mods. So post your mods and explain what you did and any other tips or tricks for future moders! 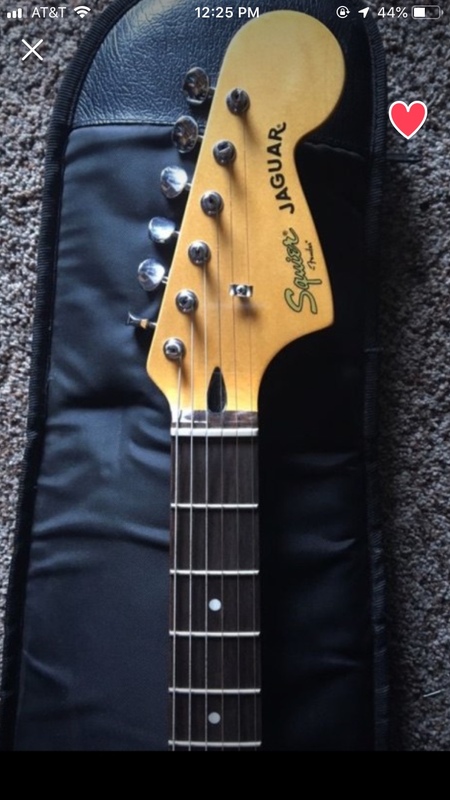 I found my Jagmaster on CL for $100 in 2016. Painted the ugly tort PG black. Replaced pickups with SD Pearly Gates and Gibson 496r. 3 way rotary switch w/ chicken head knob. But then I went back to the stock pickups and toggle, back to stock knobs, but also had to use flat humbucker rings to cover the cuts I made earlier to fit the nickel pu cover from the mod. The guitar just sounded better stock to me. Afrika61, Botso and surfrodguitar like this. Looks amazing! Thanks for some cool ideas! I no longer have this guitar.. Replaced the stock pickups with GFS Filtrons and all the plastic to black..Don't remember if I replace the electronics or not..Probably did..I usually do that.. Looked much better and sounded much better..
Afrika61, Botso and ElRey67 like this. How do you feel about the GFS quality? I was going to use GFs active pickups but they were out of stock. I found EMGs instead used at a good price. But still may want to use GFS pickups in the future. GFS quality is hit and miss..But I will say this, when I get something from them that I'm not happy with they do try to make me happy..
As for their pickups, The ones I used were, IMHO , as good as most other's higher priced ones.. But since I've discovered Rose pickups I look no further..
Botso and ElRey67 like this. Middle pickup was a neck pickup from a Squier 51. Toggle switch - which refused to remain in the bridge position - replaced by a 3-way rotary switch from a (different) Squier 51. Chicken head knob provided by my mods guy. The vibrato was also set up with 5 springs because I like the vibrato bar to give a bit back when I use it. Afrika61 and ElRey67 like this. Damn....I love that look. What a great mod job!! Local guy wants $210 for this. Is this a early version with a fixed bridge? No screws in the upper screw holes used to mount the bridge: it's likely an aftermarket bridge. 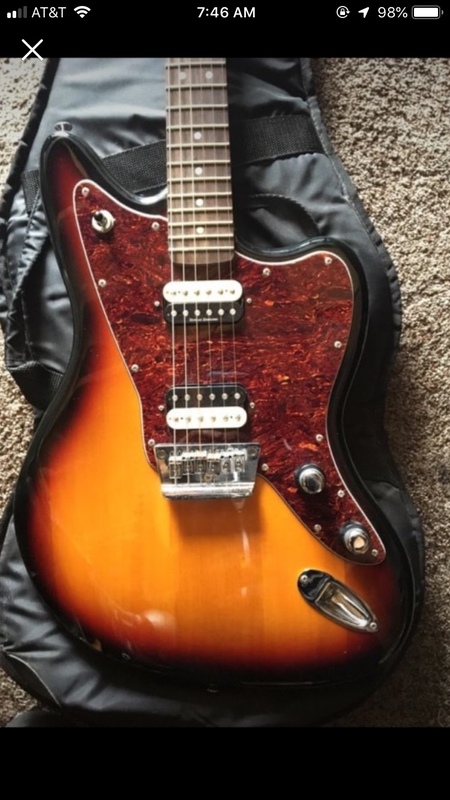 Doesn’t look like an original Jagmaster because the pu toggle is on the wrong side. And the bridge looks like it’s going over the pg. I don’t think the early versions offered fixed bridge either. Pics look legit but yeah haven’t seen any others like it online yet. Or it could be according to Wikipedia says it’s a Jagmaster II, 24 inch with 22 frets. Haha well it says on the headstock Jaguar so I don’t know what it is. Body looks like basswood. 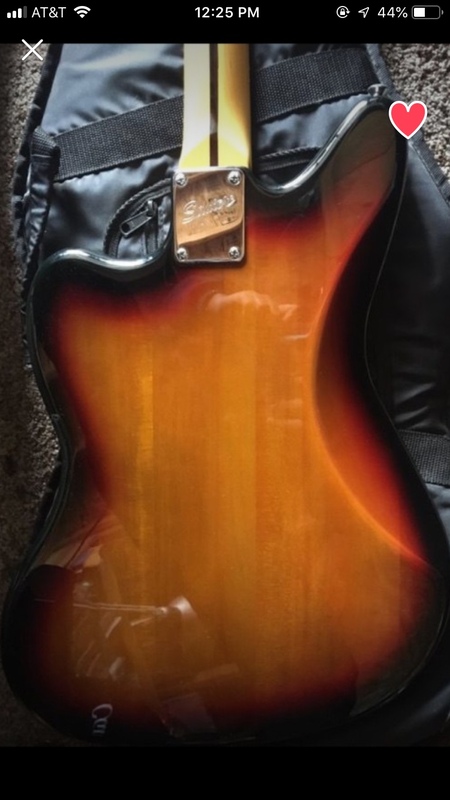 Warmoth custom job with a Squier neck perhaps? The whole thing doesn't look... quite right to me. so1om, surfrodguitar and ElRey67 like this. I actually just came back to say it reminds me of the old VM Jazzmaster, but with humbuckers. Cool! Gonna see if I can check it out.